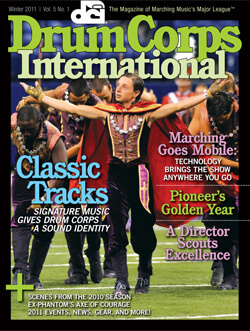 Drum Corps International Magazine | Winter, 2011 | Vol. 5 No. 1 Click magazine to read in full screen. Playing Favorites Over nearly four decades of DCI history, some corps have become identified with certain composers and styles of music—while others are known for avoiding patterns. Device Squad Podcasts, social media, streaming broadcasts, and video-on-demand are bringing drum corps fans more ways than ever to enjoy the action. Scene During the 2010 DCI Tour Capturing some of the great off-the-field moments from last summer's tour. Age-Out Phantom Regiment alumnus Todd Abrams has become the "King of Fling" under his knife-throwing stage name, Jack Dagger. Commitment to Excellence Corps director Dann Petersen is helping restore the Madison Scouts to glory. Plus Lessons in brass, percussion and color guard ... New Finals Week format … Star Alumni return to the field in Indy … Drum corps apparel … Tour of Champions … Plan your stay in Indy … Pioneer celebrates its 50th year … and more!